Karaoke helps us a lost in practicing songs but sometimes we are unable to sing perfectly because of its extremely high note. Perhaps you too like and find your favourite karaoke tracks most of the time on Internet. If you too love to sing and find that your favourite songs and its karaoke have high pitch note and want to low to make it suitable for you then this post may help you in some way. Let us see how but before this, I would recommend you to keep a back up of your song or karaoke so you may not feel like lost. 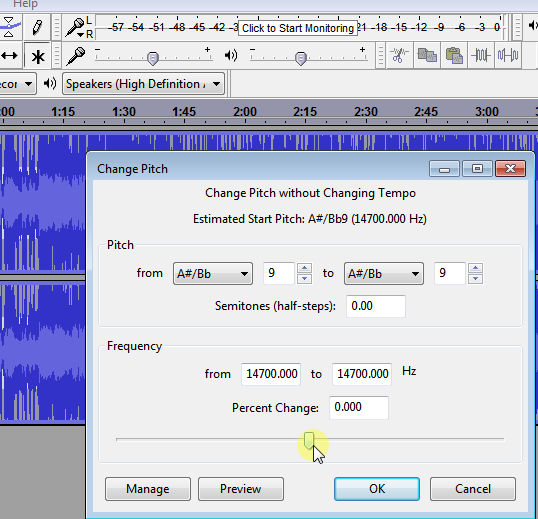 You can change your karaoke song's pitch with the help of the software called Audacity, which is open source software, and free too use. 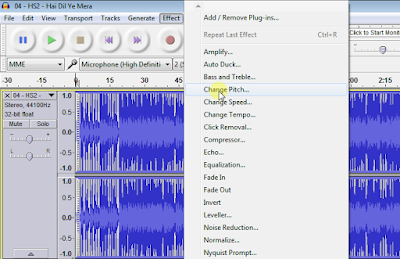 Though there are many alternative to audacity and free software available in the Internet but I tried the audacity which I find myself more comfortable with it because it is very easy to use. Changing pitch is easier than you think. Let us see how. After installing the software just launch it and click on file>open to select your songs or karaoke which you like to change the pitch for. 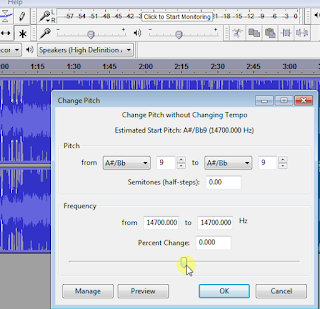 Now after choosing your file you are about ready to change the pitch and for this just click on Effect tab and then to change pitch that is it. Again, you can not only set the note low but also modify or increase the label your scale as per your requirement. You can bring your song or karaoke's notes down or up by semi, half or more than that. If you have songs and its original karaoke with the same scale then I would suggest you to bring your song also to the same pitch because when you will have a song and karaoke with the same pitch then it will great to have better practicing. After changing go to file>Export Audio and save it wherever you like. So, enjoy singing and practicing. Do you know that now Corporation bank has made easier for their cardholder customer to avail the mobile top up at their bank's ATM any time or anywhere? Yes, if you are a corporation bank's customer then it is for you. You can recharge your prepaid phone at your ATM cashpoint whenever you want. In addition, there is no extra registration procedure required. There are two simple ways, which are easy and helpful for everyone. Let us start one by one. 5. Put amount and then press submit. At last, you must check your phone balance. However, you would get the confirmation msg also. This sms service enables you to recharge your prepaid number at anywhere and any time in India. The best part of the service is getting the recharge even if you are on the way or traveling. It means you do not have to go anywhere. It is indeed a great help in case of balance shortage. To avail the service, you need to register your mobile at ATM cashpoint, which is one time registration. Other available option of registration is to fill and application form, which you can submit at your home branch. After registeration, you will get the confirmation sms along with recharging access code and the format that will show how can you have the recharge. To recharge you need to send sms to your mobile operator with the amount you want and your personal access code according to the format, which will be given to you. As you send the msg to mobile operator, the sms goes to your bank for authorization and your bank debit your account with the amount that you opt for. As soon as the debiting of account done, you will get recharge from the operator with confirmation sms. You can recharge any prepaid number and the limitation of recharge is Rs.10 to 10000. Most people go to vendor or shops to top up their mobiles. Obviously for the two options, which are voucher and easy recharge because these are the most common and known by everyone. However, sometimes you may have in the situation when shop is closed or balance ends at late night or perhaps any could be the reasons. Therefore, the best option to tackle the problem is, to have the information of all the possibilities to top up your phone, which will make your life more comfortable. Again, there are different ways of recharging your hand phone but it fully depends on you that how could you manage and use these ideas in your life. So, let us start. 1. Top up your hand phone via ATM Machine. Bank facilitates their cardholders with many services at ATM cash point to get not only the facility of withdrawing money but also to refills their prepaid phones and this really makes our life comfortable. It is very simple and there is no required of registration to avail this. Whenever you need recharge, just go to your bank's ATM and insert your card(usually as you do for withdrawing money) then go to the option mobile top up and follow the other displayed instructions like putting your phone number and amount detail and that's it. In no time the balance will be credited and you will also get confirmation sms. 2. Recharge Online-The other option which would help you is 'Online'. Yes, you could go to your network provider's official website, then choose online recharge through their process and get your work done. Besides this, there are so many good and authentic websites available on the net for instance paytm.com, monkey.in, rechargeseva.com etc that opt you top up facility. The online procedure with these webs is very simple that starts with registration and after that you need to put your number which you want to top up and pay by your debit or credit cards or net banking. Other than talk time you could also recharge your dis TV, bills etc and also get other facilities such as scheduled and missed call recharge etc. 3. Top-up voucher-The voucher top up is common and known by all. You just have to put the codes on phone as printed on the coupon and that's it. While traveling it is a great to carry some extra vouchers with you which could help you in time of emergency. 4. Talk time Loan-Today almost all leading telecom companies like Airtel, Vodafone, Reliance, Aircel, Idea, Tata Docomo etc have started the talk time loan facility for their users in time of emergency. 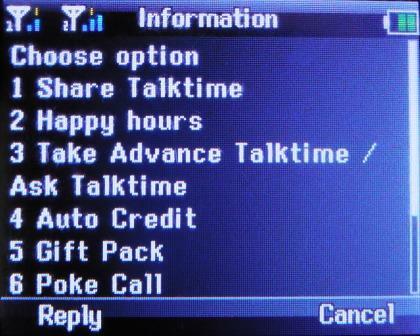 Talk time loan is a loan which you can take from your operator in times on need. It provides great help obviously when there is no any other medium. You could take Rs. 5, 10, or 25 as loan according to your service provider's terms & conditions. For example one of the conditions is one can avail the facility when he/she will be the active user for at least 3 months or whatever as per your operator. Company takes back the given amount along with some interests by deducting your balance whenever you recharge next. So, let us see some of the briefs. Airtel- Airtel customers can dial *141*10# and press the call button and follow the rest instruction to get Rs. 10. However, you can also dial *141# that will give the option to take advance talk time and other important options also like 'Auto credit', 'Gift Pack', 'Share Talk time', 'Happy hours' and many more. Aircel-To get Aircel talk time loan of Rs. 10 you have to dial *414#. Idea-Type *150*10# and hit your call button to get airtime of Rs. 10. Vodafone-To avail this, you have to sms CREDIT and send it to 144. You will get Rs. 5 as a loan but under some terms & conditions. Therefore, to know more about its conditions you have to dial 1241. Tata Docomo- Sms LOAN and send to its toll free no which is 369 and you are all done. Generally this facility is available on all service operator for prepaid customer and this could be said as the real life saver in times of need. Let see how? Voda to Vaoda- If you are Vodafone customer and want to share balance to other Vodafone number then dial *131*Amount*Mobile No#. The sharing balance limit is minimum Rs. 5 and maximum is Rs.30. Charges for transferable amount Rs. 5 to 9, Rs. 10 to 24 and Rs. 25 to 30 are Re.1 Rs. 2 and Rs. 3 respectively. You could also dial *130# to request or transfer balance. Note-If you are a new user then this may not work for you. Voda provides the service to those who have completed at 30 days. Airtel to Airtel-You can transfer an amount of Rs 5 to Rs. 31 and from Rs. 51 to 101 as per your requirement. For this dial *141# and then you will be taken to next menu. Choose the right option in the menu and proceed as the instruction guides you. Chargeable amounts are Rs. 2 to 4 for Rs. 5 to 31. Note-To avail this, one has to be in Airtel network for at least 90 days(3months). Aircel to Aircel-Its users have to dial *121*666#. As you dial, the next menu will pop-up and ask you to choose the balance you want to transfer. Just put the number and confirm the rest instruction and you will have it what you want. Again note it carefully that the facility is for the Aircel prepaid customer only who is using aircel for at least 3 months. In addition, extra amount would be taken as service charge are Rs 1, 2, 4, 8, 10, 12 for Rs. 5, 10, 25, 50, 75, 100 respectively. For more dial the above number or talk to customer care. Uninor to Uninor- Just press *202*Number*Amount and then # and hit your call button. For instance *202*9870980000*10# and you are done. Idea-To transfer you have to dial *567*Mobile No*Amount#. Note- you and your receiver needs to be its user for at least 90 days. 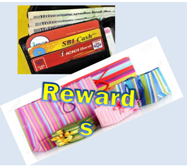 Bank loyalty program is a designed to reward their valuable customers who have credit and debit cards. When customer use the cards for buying any products and services like online shopping, purchasing or bookings at merchants outlets then they get reward points every time from their bank and some time from the merchants also. Today these types of initiative program attracts more customers and encourage them to partly involve and increase use of card, and almost all the banks has launched this program. Some banks say that the program is a just way to say thanks because their customers are valuable and special and participating in the program is beneficial for the customers. As I said above that, you earn point whenever you make payment through cards. Generally you would earn 1 point(that is equal to Rs. 0.25) whenever you spend Rs. 100 on using debit card and 2 points on using credit card or perhaps it may vary from bank to bank. And later on the collected points/bonus can be redeemed anytime against different services and products like electronics, home appliances, jewellery, mobile/DTH recharge, Air tickets and many more from bank's partnered merchants/outlets. However to make this simple, some banks have collaborated with the outlet website, which is www.maxgetmore.com. This is the website, which brings the entire partnered merchants in one roof so you do not become lost. To start and know more you should also read the terms & conditions so to make yourself clear about points and validity of points as per your bank. According to banks, anyone can avail the service who is 18 and above and has debit or credit cards. Perhaps some banks offer this service for their credit cardholder only for eg. Canara & Kotak Mahindra Bank. So for more you should consult your bank. If you are a bank customer then you are already enter in the program automatically and became its member. It means you do not have to go through extra registration process. Nevertheless, to enable and get its' benefits like redeeming point or bonus you have to activate your account through activation process. to activate the account you can go to your bank's official website or you can consult your branch office. While registration at official web, you just have to put your card number and generate your password or whatever according to your bank's requirement. After registration, you can also check and redeem your earned points whenever you want. Bank Loyalty programs with their name. These are the list of banks, which have launched the loyalty program for their customers. Today mobile has become a crucial part of our life. And without it our life would not go smooth. With it, we can do a lot of tasks with ease. Well, I am not here to tell about it because everyone knows its uses and importance. 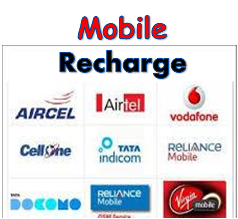 Here I would like to tell the unique way of mobile recharge that you can go for. There are different networks services which people use today to stay connected with their offices, friends, relatives etc. Whether you belonged or use any operator services you must have the balance in mobile, whether prepaid or post-paid to avail the services. 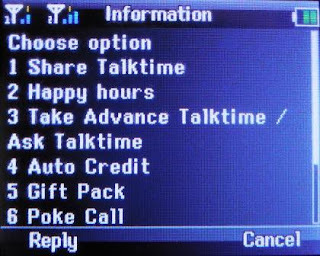 There are numerous ways of recharging your prepaid phone in which missed call recharge is one of the best and easiest options you can try. It will save your time and energy too. 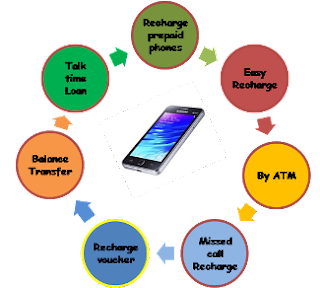 It is a service through which you could top up your mobile at any time just by giving missed call. It's great when suddenly your balance goes zero or while traveling. And also you do not have to log in and put your car's detail every time. Rechargeseva.com-Besides other services like online prepaid, postpaid recharge, DTH, Gas bill payment etc. It gives a unique facility of missed call recharge to any number for its registered users. The process is very simple. Just go to the website and get registered just by entering your name, email ID, your mobile no and creating password. After you can set any number with amount that you want. At last, fill your m wallet with extra balance and all you are set to avail the service at any time. Now whenever you want to get a balance in your phone, just place a missed call to its toll free no which is 1800 200 3644 and you will get your top up which you have set. Munkey.in - It is another website which gives the same service. The registration process is same like the above web. You have to verify your mobile number through the code that the site will send you. After verified you can liable to use its services. Load enough cash to you account and set your recharge details and you are ready. For recharge give missed call to 08826887555 from the number you have set and that's it. Other than this facility it also gives schedule recharge facility. For more details visit the websites.